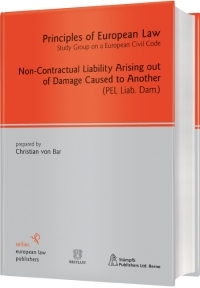 “Non-contractual liability arising out of damage caused to another – Principles of European Law”, by Christian von Bar, July 2009, Oxford University Press, Bruylant, Staempfli Publishers, ISBN 978-3-935808-63-7. This publication contains valuable information on the tort law of 25 jurisdictions within the European Union (EU). Together with another publication already presented on this blog it helps to find the most favorable jurisdictions for the victims of climate change who wish to sue companies running fossil energy power plants, refineries or other climate damaging installations. Most of the EU Member States require three conditions to be fulfilled: (1) there must be a damage (2) caused by an act or an omission of the alleged tortfeasor (3) and the tortfeasor must have committed a fault (249, 250). From this basic rule deviate, towards more stringency, Austria, Germany, Portugal and Estonia in so far as these states require a certain “absolute rights” or “protective statutory provisions” to be violated (250; 254 for Austria). Furthermore, there are some variations to be noted for the Anglo-Saxon law systems (England, Scotland, and Ireland). The following states set-up an additional requirement “wrongfulness” which might be particularly difficult to confirm for purposes of climate damage litigation: Austria, Estonia, Germany, Greece, Hungary, Italy, Latvia, Lithuania, Poland and Portugal (251; 252 and 254 for Poland). The definition of wrongfulness is different from one state to the other. “The only common denominator is the notion that a person acts wrongfully if that person infringes a mandatory duty or a prohibition of the legal system” (253). Comment: Given the vagueness of the term “wrongfulness”, victims of climate change should, in case of doubt, avoid jurisdictions requiring “wrongfulness”. In court proceedings, victims of climate change might be confronted with the counter-argument that emission of CO2 and of other climate damaging gases was subject to an authorization procedure of the state or on behalf of the state and that, therefore, wrongfulness would be to be denied. Moreover, some national law systems might deny wrongfulness in case of legally / socially accepted behavior or hazards. Whether this is the case or not, cannot be known by the mere lecture of this publication and thus would merit a deeper examination. “Fault” is the “umbrella term for intention and negligence” (255). The relevance of a fault is weaker in the Anglo-Saxon law systems (255), but the House of Lords' interpretation of the rule in Rylands v. Fletcher, adding the criterion of foreseeability, leads to a similar result in England (563). Fault is replaced by “blameworthiness” in the Hungarian law (255, 561). The distinction between intention and negligence is of minor relevance, except in the Portuguese law where the right for damage compensation can be reduced in case of negligence (255). There is a tendency to drop the requirement of fault in favor of a so-called strict liability. However, this tendency is to be observed only in particular EU Member States and for certain circumstances. Thus it is referred to cases where the law imposes certain obligations (Portugal and the Netherlands, 258) or to the fact that the risk causing the damage emanated of the sphere of the tortfeasor (Netherlands, 258). In addition, the Netherlands have a strict liability for “hazardous substances” (Article 6:175 of the Civil Code) which encompasses gases (562), but is the hazard of climate change included? “A substance is hazardous if it is known that it exhibits properties that pose a particularly serious danger to persons or things”, e.g. for being inflammable or poisonous (562). The French jurisdiction refers to the responsibility of the guardian and thus circumvents to some extent the requirement of negligence (259, 560). The Spanish law is “largely approximating liability for negligence to strict liability” (259, 558: by case law), and is “reversing the burden of proof in respect of fault” (259). Furthermore, according to Spanish caselaw, “only proof of an exhaustive carefulness enabled exoneration from liability in cases where there was a situation of increased danger, with the result that ultimately … only force majeure remained as a defense” (558). The Italian law also knows the reversal of the burden of proof, and caselaw derives a strict liability from Article 2051 of the Civil Code (260, 560, 561). The Hungarian law sets-up a strict liability for “dangerous activities” and “activities which are hazardous to the environment” (260, 561). Comment: As the vast majority of scientists and the general media point to the causality of CO2 and other gases for the climate change, a fault in its form negligence can, at first sight, easily be assumed for those who caused emission of climate damaging gases. However, the national law systems might – and this has not been examined by the book referred to here – deny negligence in case of legally / socially accepted behavior or hazards. There are several dogmatic connectors for such an argumentation. E.g. judges in some EU states might argue that CO2 and other industrial gas emitters did not violate rules of due care as they have undergone applicable authorization procedures (though, and this would be the major counter-argument, these procedures deal only with other risks than those caused via climate change). In other EU states like in Germany (589) and in Sweden (591), the negligence sub-criterion of “avoidability” could be denied. Victims of climate change could face the same or similar arguments in court proceedings if they base their claim on strict liability. According to a common rule, “Each party involved must generally plead facts in their favor and prove them if required” (260) unless the law or case law provides otherwise (261). In Spain, the burden of proof with regard to the “fault” lies with the defendant (261). The Estonian, the Hungarian and the Slovenian law only impose the duty to justify their behavior to the defendant; in these three states the plaintiff still needs to demonstrate the fault of the defendant (261). The German law knows some cases in which the burden of proof for negligence is reverted to the defendant, e.g. if a product causing a damage was defective or in special cases of environmental law (261) or where a protective law has been infringed (262, 263). The last case re-emerges in the Italian and in the Austrian law (262). In the law of the Netherlands, there is a reversal of the burden of proof “where a written or unwritten safety norm or a duty to observe safety standards is violated” (559). Moreover, “it is said that torts committed without fault remain the exception” (559). States that do not know a reversal of the burden of proof have sometimes chosen other paths facilitating the task of the plaintiffs. Thus the “corrective device of prima facie proof” (first evidence proof) emerges in Portugal (263). Others like France have developed a jurisprudence on “presumption of negligence” (263). The Anglo-Saxon law systems compensate the absence of a reversal of the burden of proof by a lower requirement for evidence: evidence presented by one side must be more convincing than that of the opposing side (263). This is substantially more lenient than, e.g., the German law requiring the court to be convinced “beyond any reasonable doubt” (263). Likewise it is sufficient, under Swedish law, that “it is clearly more probable that the damage originated in the manner alleged by the claimant rather than by the defendant” (264). Comment: The rather low requirements of evidence in the Anglo-Saxon law systems within the EU and in Sweden make these particularly attractive for climate litigation cases. The same might be true for Italy and Spain where there is a powerful reversal of the burden of proof for fault. However, given the common knowledge on certain gases causing climate change, one does not need to refrain from launching climate compensation claims in any of the EU Member States just because of the issue of burden of proof. Most of the EU Member States dispose of specific laws or articles for environmental liability. However, it is very difficult to assess whether these laws or articles can be successfully referred to for climate litigation. These laws and articles have mostly been conceived to cover cases where the damage occurred in vicinity to a dangerous activity or installation. In some EU Member States, the criterion of vicinity is explicitly mentioned (e.g. Bulgaria (727), Finland (733) or Sweden (731)). A causality chain passing by the heating up of the atmosphere was probably not in the mind of the lawmakers. The publication is not detailed enough to positively ascertain that there would be good chances for referring successfully to these laws and articles. Thus we can only recommend anyone attempting to bring such cases to court, to examine more in detail whether in these states’ specific environmental liability laws and articles can be used for climate litigation, regardless of whether this was initially intended by lawmakers or not.